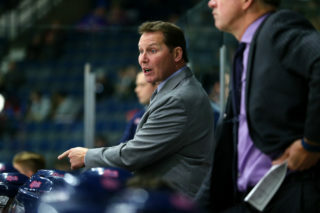 The Regina Pats earned a single point in a 4-3 overtime loss to the Saskatoon Blades on Friday night at the Brandt Centre. The Pats opened the scoring when Wyatt Sloboshan beat Nolan Maier five hole for his fourth of the season and it was 1-0 after one. Bryce Platt extended the lead to 2-0, also with his fourth, but Saskatoon responded on a five on three powerplay and it was 2-1 Regina after 40 minutes. In the third, Saskatoon scored 29 seconds in and then again at 12:51 to take the lead at 3-2. The Pats battled back with a powerplay goal from Jake Leschyshyn, his ninth and it was 3-3, forcing overtime. In the extra period, Evan Fiala put home his own rebound and the Blades took the extra point in a 4-3 final. The Pats outshot Saskatoon 33-26, the powerplay was one for five, the penalty kill five for six and Tyler Brown made 22 saves in the defeat. 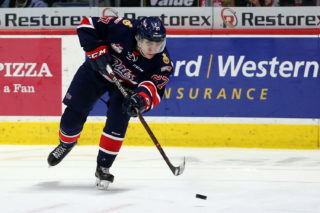 The Pats (16-14-3-0) are right back at it Saturday night at home to the Lethbridge Hurricanes. Puck drops at 7 p.m. at the Brandt Centre. Regina – Wyatt Sloboshan (4) from Bryan Lockner and Egor Zamula – 13:33. Regina – Bryce Platt (4) from Koby Morrisseau – 3:13. Saskatoon – Mark Rubinchik (2) from Cameron Hebig and Braylon Shmyr – 16:33 5v3 PP. Saskatoon – Evan Fiala (2) from Kirby Dach and Jake Kustra – 0:29. Saskatoon – Josh Paterson (11) from Alec Zawatsky – 12:51. Regina – Jake Leschyshyn (9) from Dawson Davidson and Liam Schioler – 15:48 PP. Saskatoon – Evan Fiala (3) unassisted – 3:44. 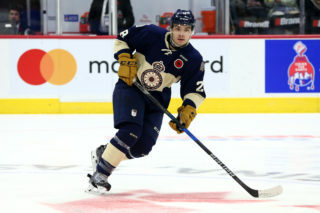 – Sam Steel made Team Canada for the 2018 World Juniors on Friday, Josh Mahura was among the final cuts. 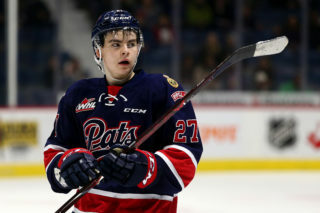 – The Pats are now 1-1-1-0 against Saskatoon this year. 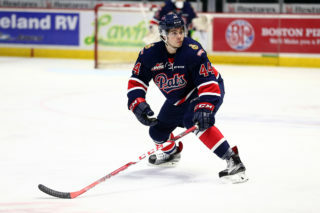 The Pats are right back at it Saturday night at home to the Lethbridge Hurricanes. Puck drops at 7 p.m. at the Brandt Centre. Tickets are available at reginapats.com, the Brandt Centre Box office and at all Regina Safeway locations, Safeway Funzone tickets are just $13 plus tax.